At a meeting of 250 boaters in Rockland, Maine I asked for a show of hands: “How many of you have registered your DSC Radio and have an MMSI number?” Seven hands went up. Seven hands went down. In a room full of boaters, not one of them really knew how to use their radios to signal a distress. My guess is that you probably don’t either. Digital Selective Calling (DSC) has been built in to every VHF Marine Radio for over 15 years, still most boaters I talk to don’t know what it is; fewer still understand its capabilities or its value. It is likely the most under-utilized piece of safety equipment in boating and, quite frankly, I’m tired of it. 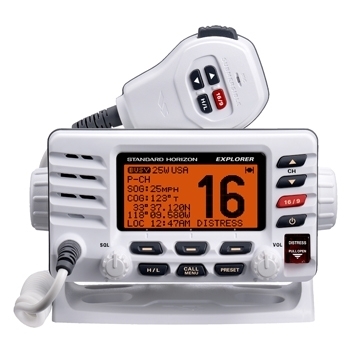 If your boat has a radio, chances are you have the the ability to – with the push of a few buttons – tell the Coast Guard who you are, the name of your vessel, your exact location, and the nature of the emergency you are having while simultaneously sending a distress message to every other vessel within line of sight. Your EPIRB can’t do that. Your SAT phone can’t do that. AIS Can’t do that. And that’s not where the value of DSC ends. Your radio can also query other boats and get their positions. It can selectively call another vessel, or group of vessels ,or shore stations, and auto-tune their radios to respond. Continue sending distress signals even if the captain is incapacitated. Allow for a non-experienced users to send, with the press of a button, a distress message. Privately hail another DSC equipped vessel, or shore station. can “Ring” other boats without having to constantly monitor the radio. free up channel 16 as a hailing and distress channel. Can be used to call “groups” of other vessels or shore stations. But your radio won’t do any of these things if you haven’t first set it up. So, let’s get to how. Step 1: Make sure your radio was build in the last 15 years. Look at the buttons on your radio. If one of them is marked “distress” (usually protected by a red cover) then you have a DSC enabled radio. If you can’t find it, check the back of the mic. Older radios had the button there. If you can’t find the distress button, you need a new radio anyway. Get one. MMSI stands for Maritime Mobile Service Identity; think of this as a phone number for your boat. You must have registered an MMSI to take full advantage of your radio. Good news; this is usually free. If you boat just in the U.S. and you aren’t a commercial operator or otherwise required by law to have a radio, all you have to do is register at one of these sites and you’ll have the 9-digit code you need to make your radio a super-radio. Find the owner’s manual for your radio. Lost it? It’s online – trust me. Contained therein will be a section on using the DSC functions of your radio and it will include how to program it with your new MMSI number. Read the instructions and follow them. Also in your owner’s manual will be instructions on how to connect your vessel’s GPS. It will just be a couple of wires and this won’t require advanced training, but you can always ask for help from professionals. Some models of DSC Radios can even be linked to shipboard sensors to automatically send DSC alerts. If none of this surprised you and you knew all about DSC and how to use it, congratulations. You’re a rare boater, indeed. But send this article to your friends. Most DSC radio alerts still come from unregistered radios that are not connected to a GPS. It’s maddening to me. Right there next to the helm is a way to hail your friends, find out where they are, and ask the world for help if you need it. Chances are, you had no idea it was there. Did you? Didn’t you? Make a comment below and let me know.